IAF Commander Eshel says IAF can deal with all weapon systems. "The question is only -- at what cost." 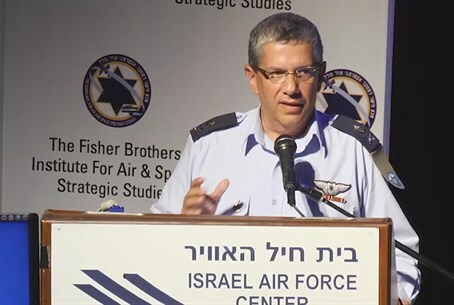 IAF Commander, Major General Amir Eshel, spoke Wednesday about the IAF's preparedness for a surprise war scenario with Syria, and said that the S-300 anti-aircraft system is on its way to Syria. "A surprise war can come about through many scenarios at present," he said at a conference of the Fisher Institute for National Security in Herzliya. Isolated incidents can escalate very quickly, he explained, and added that "we are committed to being ready in a matter of hours and to operate up to the end of the spectrum." "The Assad regime has invested a lot in order to attain the best aerial defense capabilities that it could buy," he said. "We are talking about weapons from a completely different generation, nothing like what was there before." He noted, however, that, "There is no system that does not have a solution. The question is only -- at what cost." "From the little money he has," Maj. Gen. Eshel explained, "Assad has invested billions in buying the best weapons systems Russia can offer, including the S-300, which is en route to Syria. And he is not the only one; everybody is busy acquiring such capabilities." Merely possesing these systems will make Assad more belligerent, he warned. "Any country that is given the wonder system -- its name doesn't matter -- that will make it feel that it is protected, will allow itself to do things that it would not otherwise do, and for that reason it has strategic importance beyond the operational importance." "In order to unleash the IAF's intense firepower, aerial supremacy must be attained," he said. "Should Syria collapse tomorrow, we may find ourselves ver quickly with this huge weapons arsenal scatterring and facing Israel. If, in the Second Lebanon War, we used only part of our abilities, in the next war we will have to give 100 percent, so that the operation will be fast and very powerful."